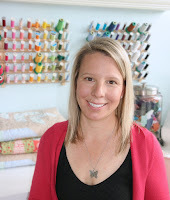 Kimberly and her fabulous staff from the Fat Quarter Shop have brought us another new shortcut pattern...for free!! I had to conceal my eager excitement to be contacted by the Fat Quarter Shop when they asked me if I would make a quilt from their new pattern. I love all the shortcut patterns and have made three quilts from their Simply Fat Quarters book! 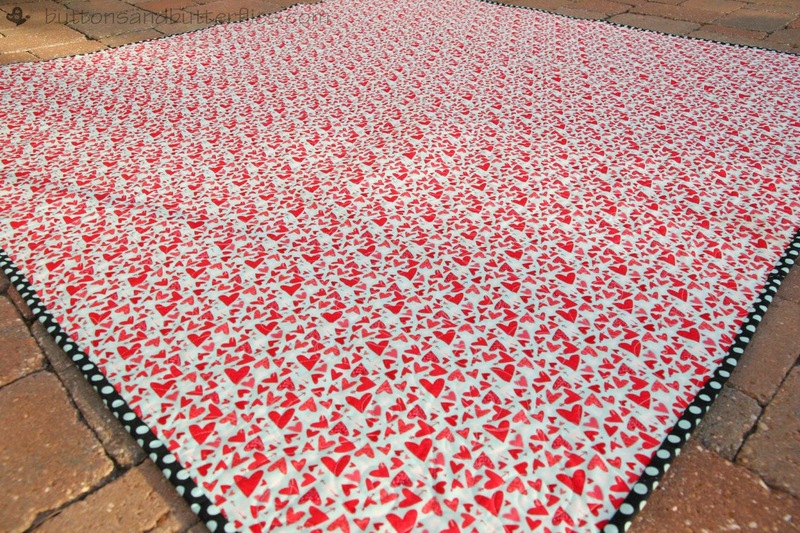 Since Valentine's Day was around the corner and I have always wanted to make one, I chose to make my quilt using Kiss Kiss by Abi Hall layer cake and a Black Bella Solids Charm Pack from Moda Fabrics. I LOVE this quilt. Simple to make. Quick to finish. SO much impact. He epitomizes layers of charm, doesn't he? Kiss Kiss Aqua Hearts Galore for the backing and Kiss Kiss Black Dots for the binding...a very rare thing for me to use an entire line for everything. But I love how the pink had more salmon tones and the teal just popped here and there! I have been trying to contain my excitement for a while and gave teeny tiny peeks on Instagram. I'm still so excited about this pattern that I would love for you to make one too! Layers of Charm Free Pattern is available here. Layers of Charm YouTube Video is available here. I think this Riley Blake Fox Trails by Doohikey Designs layer cake would make an adorable quilt with the Layers of Charm pattern. All you need add is a charm pack and you have a great quilt! 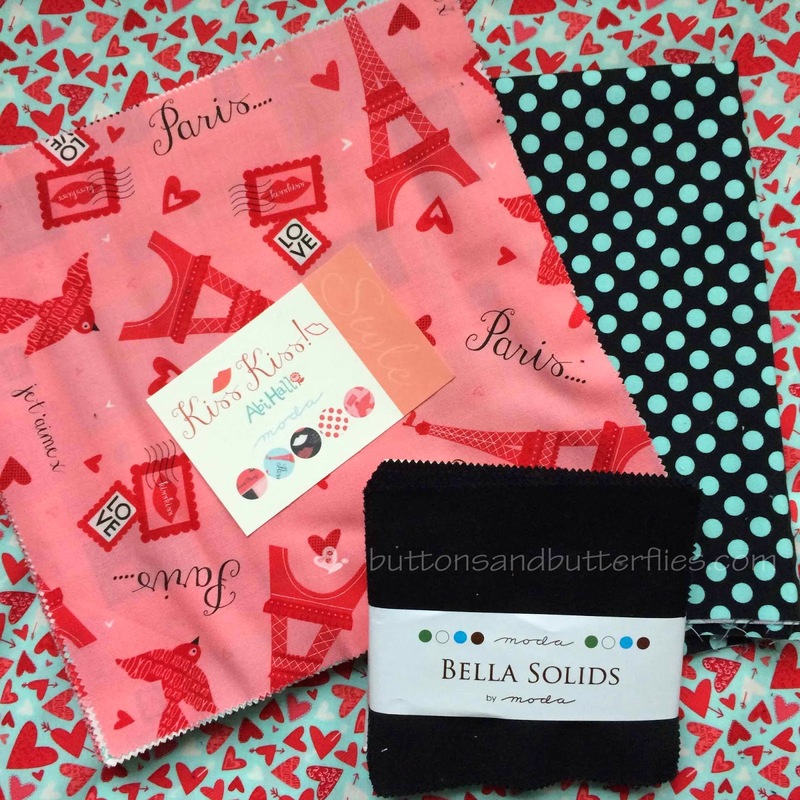 tell me which is your favorite Fat Quarter Shop shortcut quilt to enter the giveaway. Winner will be notified via email (and here) no later than Sunday, February 15th. Love your quilt! How very Valentine's <3 And that camping fabric is awesome - with some brights like orange and blue, backed in flannel, it would make a great one for cool nights under the stars! Hmm... I think I would bring out the green for the diamonds. Thanks! So many possibilities. Probably one of the bright colors to coordinate with the fabric. Like the pretty blue. I'd go orange! 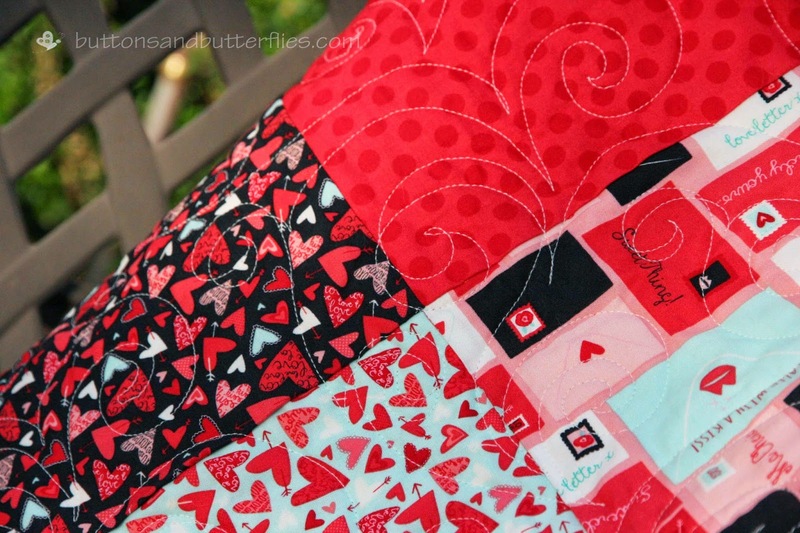 Love that camping fabric and your valentines inspired quilt is gorgeous. I think I'd do a green or blue charm pack [or maybe step outside the solids and do a green/orange/blue pattern] with that layer cake! LOVE your quilt and your model! I'd probably bring in a raspberry because I love how that color goes with the blue and green! Nice job on your quilt! I love the black solid you chose. I would use a dark chocolate solid with that adorable Layercake. I think I"d use a shade of green for that fabric collection. I love the shortcut quilts from FQS-I just finished making the Fat Quarter Fizz in Lexington fabrics! I think I'd use the Boat House layer cake with navy and red charms. I've been in a RWB mood lately. Thanks so much for sharing! Great quilt - I love this pattern! I would use chocolate brown for the quilt. Thanks! I'd probably alternate between green, orange, and aqua for charm squares. Oh my! How wonderful! This is stunning and I love your quilting! Perfect Valentines quilt!!! I so want to make tons of these quilts! 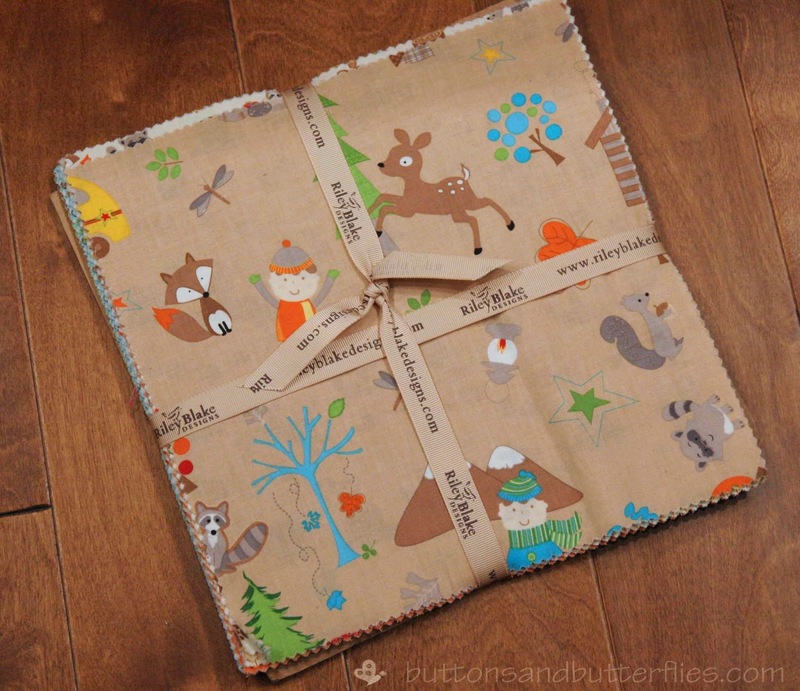 Love your quilt and am so excited to make one! I think I might add an aqua charm pack to your layer cake! I'd use a red to make those tents pop! I'm a bit of a subtle bunny, so I'd probably go with a charcoal colour to coordinate with the little critters! Yours is so cute! I would probably use green with that cute fabric. I think that I would use turquoise. Such a fun layer cake! I would use a yellow charm pack. Your Valentines Quilt is beautiful. Thank you for the giveaway. I'd go with teal and the dark yellow. I am not an orange fan and there is already enough brown! 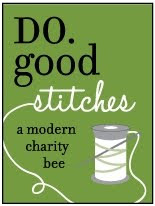 I love the hearts on the back and the black dot binding! Just makes it all come together and juump out! I would use orange as it is my son's favorite color. Love your quilt! I love how your project turned out! I never would have thought to make a valentine's quilt, but you've definitely made me reconsider that. As for the layer cake you're giving away, I'd go with an orange solid charm pack, mainly because it's my favorite color. But my second choice would be the teal color. Thanks for the giveaway! I would go with green or orange solid charms. The black charms you used really make the quilt stunning. I love how bold you went with your fabric choices! The black charm squares were the perfect choice as well. I think a brown that matches the fox and deer would look nice. Beautiful Valentine's quilt. Thanks for the giveaway. 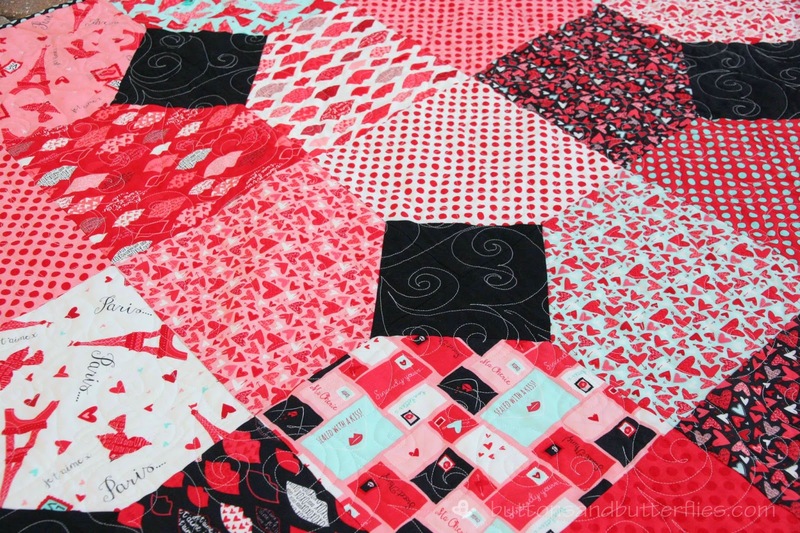 I really like the Valentine quilt that Button is wrapped up in! I am a huge fan of turquoise! Thanks for the chance to win. I would use a blue/aqua solid. I'd use a yellow charm pack. I think I would use assorted pack - why choose just one color? I would pull out the green. Your quilt turned out so cute! Thx for a chance to win! I would use orange! Love your quilt! Thanks! I ♥♥♥ your quilt! Your chosen layer cake would look lovely with a mix of colors in the corners, such as apple green, orange, aqua, and yellow, all four colors making up the square. 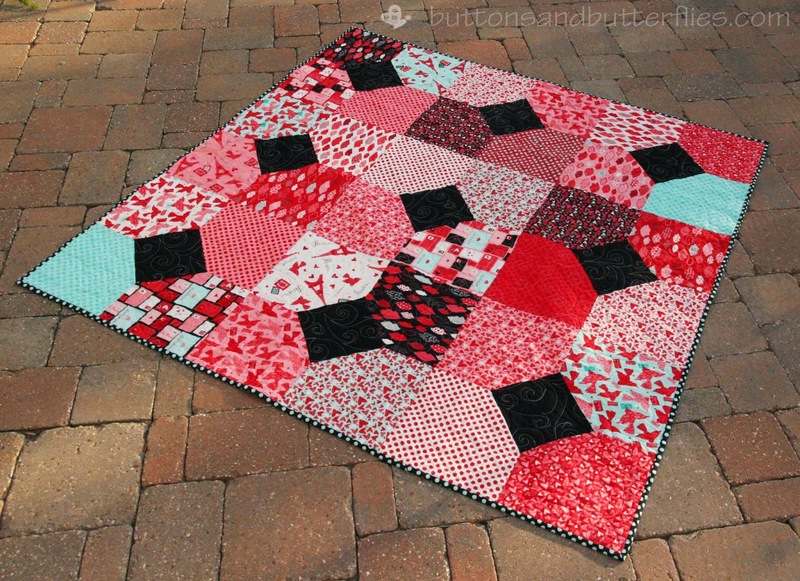 This is my favorite FQS shortcut quilt pattern to date! I'd go with chocolate brown. I love your Kiss Kiss version. It's adorable, especially with your adorable Cutie Pie snuggling in it, looking pleased as can be! I would love to use a baby blue solid charm pack! I love your Valentine quilt, just beautiful! I want one now! Thanks so much! I love the Eiffel Tower prints from that line! I'd probably use a Cotton+Steel bundle, the Playful or Mochi collection. Love your Quilt! & what an Adorable lil Model you have! These quilts are amazing, each one, looks so different! I think a cream charm pack would work well with the Layer cake you have picked out. If the layer cake has more of that bright turquoise, I'd pick a charm pack close to that! Yellow! Such a cute layer cake and pattern! I think I would use a charm pack like cheddar based on the colors in that top layer. Love your quilt with the black as the charms. Thanks for sharing. I love your charming model! I think I'd use the blue/aqua that the tree is on the top fabric! Great tutorial and I can't wait to whip one up this weekend! I think alternating solids of orange and yellow charms would be great with this to make a quarter-square triangle with both colors alternating in the diamonds. I love how you matched different pinks and red with black; great combination. 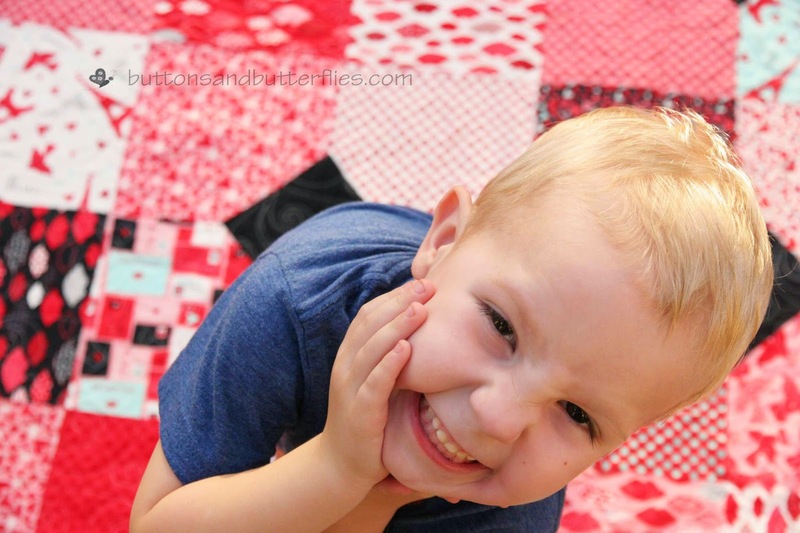 Your little one is adorable and your quilt is as adorable as he is LOL Great job Heidi! DAy sails would be my pick with a moda solid charm pack!! Wow to be chosen from the Fat Quarter shop! Koodoos. Anyway I would pick a green solid if I felt safe. It could be boy or girl. If I wanted to be out of my comfort box just a little I think I would go with an orange! I would pick out the turquoise as the accent fabric. Nice and bright. I would use the Fox Trails and a turquoise backing. Would be perfect for the new grandbaby expected this summer. I love all things red/white/blue, so I guess I'd use that.